Best Poker HUD 2019: Our Top Picks Revealed! Online poker has taken the game to the next level. The sheer number of hands you can play has let people experience all the different situations available. This experience has translated into big profits for some players and allowed them to excel and crush the games. Everyone is improving more quickly and coaching/training sites have added to the trend. As the industry has expanded, the tools available to assist you have become more varied. These tools have let people take their game up a notch; allowing them to make better decisions and put in more volume. The software is made to increase your win rate and help make more money for you. Online poker has (almost) always been more anonymous, with a much greater focus on the maths behind the decisions. Tracking software and HUDs let you track every opponent’s ways of playing and therefore allows you an insight into their thought processes. This makes the game much more real, and brings back the person vs person element. It also means you can profitably play multiple tables at once, as it’s not essential that you monitor the way every single player is playing. How Valuable Are Poker HUDs? HUD stands for Heads Up Display and is arguably the main component of poker tracking software. Tracking software runs alongside your poker client, tracking each hand and storing relevant data on every situation. This data is then shown alongside each player at the table (including yourself) so that you can easily analyse a specific player’s game, or see how your own reputation looks at the table. The database of information collected by tracking software is extremely useful for reviewing how you’ve played, tracking wins and losses, and looking for leaks in your game. HUDs themselves are used while you’re playing and track immediate statistics. HUDS come up while you’re playing and appear as rows of numbers, with player’s names and other statistics. To those who’ve never used a HUD before this can look like chaos across the screen. In fact, it’s useful information about every player’s tendencies are and how they play. With this you don’t have to remember information as it’s kept right there in front of you. 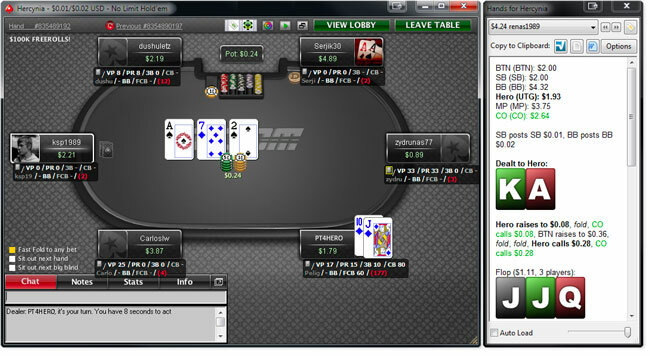 99%+ of winning online poker players (long-term) use a HUD. That stat alone should say it all. HUDs access hand histories that are stored as text files on your computer automatically by your poker client (whether that be PokerStars, PartyPoker or whichever other poker site). The HUD then mines and displays the relevant date from them in real-time. 3bet frequency – the percentage of pots a player is re-raising. Post flop decisions – how often do they check or bet the flop? Or the turn? Or the river? There are many more statistics available, and you’re usually able to customise exactly what information is appearing in your feed. All of this information is designed to help your decision making and make them become second nature – almost robotic, instantaneous decisions the majority of the time. Your HUD will be updated in real time so you’re seeing exactly what your opponents are doing against you today. All of this builds into what the picture you’re creating of who you’re up against and let’s you know how you should alter or adapt your style. While it may seem like a screen full of numbers, it’s actually your ticket to much better results once you become accustomed to it. This process doesn’t usually take too much time. If you’ve watched any successful live streamer they are almost certainly using a HUD – so you’ve probably seen one in action, even if you haven’t specifically realised it. Basically anyone who is taking the game seriously is using tracking software and a HUD. Some people use them/rely on them more than others, but there are very few serious players who don’t own the software already. By taking care of the numbers, you’re able to focus more on the decisions that matter; sensible play, timing tells, mathematically profitable plays and more. From here you can adjust your game, exploit another player’s weaknesses and make more accurate decisions. Poker is all about making the correct choices over and over again, and knowledge is the key to being right more often. HUDs aren’t just useful for the key statistics. They let you evaluate what type of player you’re up against. Poor recreational players (or fish) can be identified based on their actions, with some poker tracking software even automatically generating images (such as fish or even whales) based on playing styles. By easily being able to see the good and bad players you can instantly tell a good game from a bad one. HUDs will also identify everything from past experiences (within reasonable timeframes) and feed them into the present games. Needless to say, a poker HUD will not allow you to win every time. However, it does swing the odds much more firmly in your favour. Chances are, when playing without one on any of the big poker sites, you’re playing against someone that has more information on you than you have on them. OK, so you’re convinced a HUD can help, or you’re at least open to the decision. 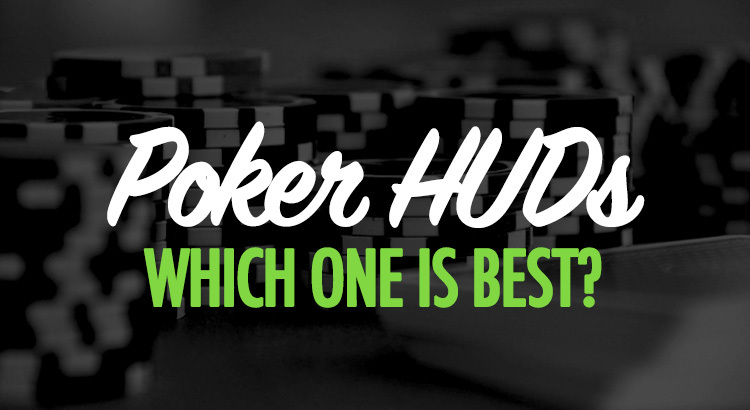 We’ve found and reviewed what we believe to be the 4 most popular poker HUDs in the market today. They each have their own features, software and are slightly different in price. Now, let’s take you through each and you can see which one suits you most. PokerTracker have emerged as one of the dominant forces in the poker software industry. They’ve made themselves popular with grinders and newbies alike through their accessible but detailed software. PokerTracker 4 is available for Mac or Windows and is simple to download. It’s one of the lighter variations so it won’t take forever to download or take up a load of space on your hard drive (only around 15Mb). PokerTracker 4 offer a 30-day free trial of the software via this link. You’ll be emailed a license key and then you can download and try out the software. Perfect if you want to see the options available. Once you’ve downloaded the software you’ll have the option to import your hands. This is where all your existing hands or future hands will come into the database and fuel the information in your HUD. While this may seem technical, PokerTracker have kept it simple so you don’t need a degree to operate it. Most of the settings can be done automatically with no need for manual input. The rest of PokerTracker has been designed to be very user friendly. They know that a lot of their users won’t be experienced programming software so they’ve kept the options limited and everything automatic where it can be. PokerTracker have an interface that is pretty simple to navigate. You’ve got 2 main areas, the live poker area or the database side. The HUD is on the live poker area, and you’ll go on here to begin an import. Once you’ve begun importing hands your HUD will pop up on the tables you’re playing and update as fresh info comes in. PokerTracker 4’s HUD is very customisable. As the HUDs appear directly on your table there is sometimes limited space so you have to be selective about which statistics to include. PokerTracker 4 have an unreal amount of different stats you can put on your HUDs. The options include pre flop, flop, turn, and river statistics but also have varieties for in and out of position, blinds, button plays etc. The choice really is impressive and perfect for those who are paying attention. If you’re struggling with particular situations you can update your HUD to include that information, allowing you to play it better next time. While you can select which stats are always shown you can also hover your mouse over the HUD to see a broader range of statistics. PokerTracker 4 features a number of preset HUDs. These include all of the essential information deemed important for playing, and is really useful for those who are new to this type of software. Each of these games plays very differently so you’ll want different information at hand to play optimally (e.g in tournaments, the pre-flop decisions are more crucial than in cash games where stacks are deeper). PokerTracker will automatically detect the format of your games but you can also easily switch between them using options on the tables. PokerTracker HUD also features colour coding. This let’s you set boundaries for each stat and the colour will change depending on the figure. For instance you can set your Aggression Factor statistic to go red when it is over 80. That indicates an aggressive player and somebody you’ll need to change tactics against. The red writing will draw your attention to this in game and let you make adjustments. The colour coding let’s you glance round a table and see how you should be playing/what strategy choices you can make to ensure the best profit margins. PokerTracker 4 let’s you see the whole cards of opponent’s even if they muck at the end of a hand. Their hand will pop up on the table once the hand has been resolved so you can see what they had. PokerTracker also lets you mark hands later and make notes on players through their software. If you think something is noteworthy then just right click and a text box will appear. Within the database you can filter for marked hands, making later review much simpler. Double click a specific hand and the replayer will load it up and play through it for you. PokerTracker have set up a fairly detailed FAQ page, with written and video guides for setup, installation and making the most of their software. There is also a forum where people can ask other users questions about certain issues. PokerTracker have a decent support system and are available to answer questions. If you’re in doubt you can always look to popular poker forums like 2+2 and PocketFives as they have specific threads dedicated to PokerTracker. PokerTracker is one of the most popular options when it comes to poker software. PokerTracker came after Hold’em Manager who dominated the market for years. There were criticisms in the past from players who would prefer PokerTracker have an easier option to create player profiles. This is important for detailed reports against individuals, and something PokerTracker 4 features quite well. While some don’t find PokerTracker 4 as user-friendly as other big names they do admit it’s a great piece of software and that the HUD is one of the best around. PokerTracker have divided their pricing, giving separate options for just Omaha players or just small stakes, casual players. You can see the pricing of PokerTracker 4 here. The different packages let you customise the product depending on your needs, meaning you can spend the minimum to have access to all the features. All of the licenses are for life and can be used on up to 3 different machines. You can swap the license over to a new computer when you’re changing. You’re also able to upgrade each package if you’re switching stakes of games. PokerTracker pricing is very competitive for such a well developed and well rounded product. The small stakes option lets those with a small bankroll have all the same perks as those with thousands, and makes it accessible to a range of players. PokerTracker have developed a great option when it comes to supporting poker players. Here’s what we think the main pros and cons are when choosing PokerTracker. For us PokerTracker 4 is one of the strongest options around and the strengths far outweigh the weaknesses. They’ve proven themselves to have powerful software and they keep bringing out updates and advancements regularly which improve it further. Holdem Manager is the original poker software that truly changed the online game. They first released their custom poker tracker before any of their competitors and the most widely used brand around. Before we get started we should let you know that HEM is still not available for Mac users, which is incredibly frustrating for fans of Apple as it is such a good choice of HUD. Their software is fairly large and can put a strain on some PCs and laptops – causing some crashes if your device is lower than average quality. 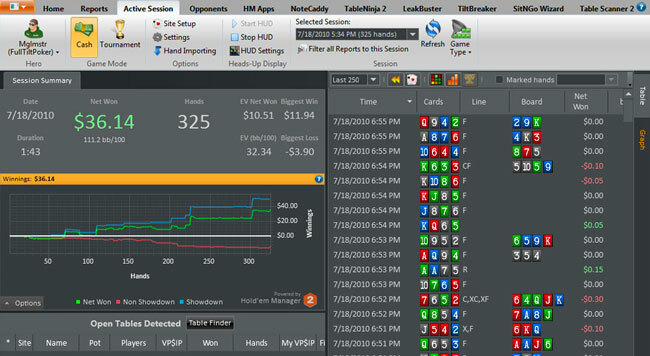 However, Hold’em Manager 2 is still on of the best pieces of poker tracking software around. Holdem Manager 2 (HEM2) is the sequel to this software and boasts over double the features and tools that the original has. Hold’em Manager have created one of the most powerful and thorough tools for tracking your game, evaluating your play and finding all of the ways to improve. HEM 2 has been created to build upon the success of the original with added value to the users. HEM 2 has a slick interface, which is stylish but extremely navigable even for first time users. The interface has been adapted to make it even simpler for those completely new to tracking software. From setup to ongoing use it’s one of the most user friendly on the market. Hold’em Manager have created a whole site dedicated to FAQs and support with the software. There is also a dedicated forum to deal with more specific queries. You’ll find instructional guides and videos that will help you get started and make the most of the tracker. HEM 2 has default HUDs for tournaments, cash games or SnGs. These feature all of the usual stats to do with preflop aggression and postflop tendencies. You can alter these or create a custom HUD depending on which stats you deem the most useful on the table. When creating your HUD it’s always a good idea to look on the forums and see what other people are using. With HEM 2 you can import somebody else’s HUD, perfect if you have a friend who’s happy to share. This is a perfect short cut for those with less experience. HEM 2 HUDs feature colour coding to easily identify the types of players online. When specific stats go above or below certain levels it will be highlighted. Then you’ll be able to make adjustments in your gameplay from only a glance round the table. These are put next to each opponent’s name and characterises their playing style. You no longer have to read the numbers to see who’s a fish or a shark, HEM 2 will literally show you. One of HEM 2’s most impressive features is the inbuilt notecaddy. Notecaddy automatically records notable hands on opponents to make sure you don’t miss anything. This means next time you play you’ll have handy notes on how they play draws, overpairs or bluffs, all written for you by the software. HEM 2 features a large database. This lets you analyse results, look at wins and losses and find potential weaknesses. The data is presented in multiple formats, most useful is the line graph which shows the direction your play is taking you. You can even add in an EV line to see if you’re running good or bad. The HEM 2 database let’s you create player personas and look in depth at their plays, strategies and wins/losses. You can identify who you’re beating the most and who is getting the best of you and run simulations to beat them. The HEM 2 database stores all the details for cash games, tournaments, SnGs and even PLO games (if you have the full package). You can switch between each simply and look at all of the results for different stakes. Hold’em Manager is providing the most in depth reports for users, allowing you to see what’s happening in each specific scenario. You can look at how you’re doing with AK, or what’s happening from the big blind. With this detailed view you can really get to grips with your own game and the strengths and weaknesses behind it. Hold’em Manager have created an app with lets you take the software on the go. You’ll be able to upload hands and check your stats on the move. While it doesn’t have all the features of the full system It’s certainly a useful plus. Hold’em Manager has an equity calculator that allows you to check your EV not just against specific hands but by inputting an opponent’s whole range. Using the range selector you can visualise all of the potential hands the villain could have and work out what the best play is. HEM 2 features a whole range of option add ons and plug ins. These include Tilt Breaker (an app which enforces a stop/loss on your game play) and Tableninja (a multi tabling tool that lets you customise bet sizing and makes gameplay simple. These integrated features are all designed to bring out the best poker player in you and add to your results. HEM 2 has proven itself to be a robust piece of software that can add value to your game. Users of Holdem Manager 1 were pretty much all extremely pleased with the software and the benefit it brought. Similarly with HEM 2 there is a lot of good chatter on the forums. Hold’em Manager have vastly improved upon the initial release version and done well to counter a lot of the bugs. It may not be perfect but it is now very usable with little trouble. Needless to say, it’s also important that your laptop or computer is not too old or slow – otherwise it would have trouble powering any piece of software. All of these are a one-off price for each, and you can check the current prices of each via this link. You’re able to install each piece of software on up to 3 devices, which you can be changed. There are several affiliate options available where you can get Hold’em Manager 2 for a discounted price when you sign up to a specific rakeback deal – it’s worth shopping around for the best price. Hold’em Manager 2 has a 30 day free trial available which is recommended if you haven’t used the software before. Try it out and see all the features, it’s likely you won’t be able to go back to poker without it! Hold’em Manager have created the full and complete poker tracker. There is very little not included with them and the usefulness and value for the user are apparent from day 1. The only real limiting factor is that it isn’t available for Macs and even the windows version can be buggy. However the creators have done well to limit all of the problems, and while less power CPUs might struggle with the software, they should be able to handle it (providing you aren’t streaming 4 different shows at the same time). Hold’em Manager are one of, if not the, most expensive trackers around, but they justify this cost with their very well made software. The range of packages does let you limit the cost a little, but if you take the time to make the most of it you’re likely to make profit on your investment. Jivaro market themselves as the next generation poker tool which has been designed to fit the specific needs of the player. Jivaro is one of the simplest tools around and has proved one of the most popular. Jivaro is really well suited for those completely new to the idea of HUDs or poker tracking. The simple options and layout make it very user friendly and perfect for newer poker players. It is also by far the best looking HUD in our opinion – making your tables look sleek and making analysing stats nice and easy. Jivaro have spent some time creating a community for people to communicate about the software and the games themselves. Jivaro pride themselves on their fresh approach of moving away from the technical and making the software simple, but efficient. Jivaro is available only for windows and not Macs (annoyingly). The software isn’t huge and won’t put a big strain on your CPU. Jivaro functions just like the other mainstream poker trackers, by accessing the hand history text files on your pc and uploading them into the database. Jivaro software works with Pokerstars (the most popular poker site by far) and some of other other major poker clients. The software has been created to integrate effectively with poker clients. It layers on top of the tables really well, with a great design, it will seem like it’s all just one program. The database (command centre) is easy to use and customisable, specifically made so anyone can figure it out in a few minutes. Jivaro has been created and adapted to meet the user’s needs. They are constantly updating and refining existing software, as well as adding new tools to allow the user to do more with the information. Jivaro’s HUD features the unique HUD circle. This coloured circle is a visual display which allows the user to see key information at a glance. The key stats involving number of hands played, raise pre and aggression are all represented by the colour shown on each portion of the circle. As you play more hands against an opponent you’ll learn more and this display will be more accurate. Alongside this visual display, the Jivaro HUD features 3 key stats. You can change these based on the position, street of play or personal preferences. Jivaro have deliberately limited the HUD to 3 stats in an effort to keep things simple and not clutter the screen. The Jivaro HUD also puts some focus on giving live stats from the games. In a tournament you’ll be able to see who’s left and what the prizes are. There is also ICM information so you can work out what your chips are worth, allowing you to maximise them. Jivaro’s HUD is a quick and easy overview of the game you’re playing and the opponents playing styles. Despite providing less information than other poker trackers the visual aspect is unparalleled by the competition. The other side of the Jivaro software is the command centre. From here you can look back over previous games, run reports against certain players and customise the HUD. It’s a lot lighter than more of the other trackers but still has some features for post hand analysis. Jivaro have some good features in their database like a hand replayed and other tools. They also make it easy to share hands, allowing others to give feedback on how you’ve played. Jivaro have taken the time to create an open space where people can discuss all things poker. With their basic option anyone can sign up for free and get involved with the discussion. The forums features everything from setting up the software to hand discussions. Jivaro have attempted to make a poker community. By allowing players to easily share hands they’re promoted discussion and learning, making them a popular choice especially with newer players to the game. This is free for anyone to sign up. You’ll have access to the basic software, the community and a number of other key features. The free option is perfect for anyone who just wants to see what it’s all about and makes poker tracking accessible for those who couldn’t normally afford it. Jivaro offer a premium membership for $4.99 a month. This includes some more advanced statistics and tools designed to improve your gameplay. If you’ve used HUDs before or you’ve outgrown the basic membership it’s still the cheapest product around which offers these features. Jivaro’s software, design, layout and technical set up are incredibly easy to use and clear. The HUD is designed to be easy to read and not clutter the screen while you play, something we really appreciate. Jivaro clearly had more recreational players in mind when they created this software, and they’ve done a brilliant job to make it as good as it is. With less complicated stats and options it’s a lot less intimidating for those who are resistant to HUDs. Compared to others on the market we believe Jivaro are offering a lot for a little. The free option is perfect for anyone who is on the fence about HUDs. Even the premium is a fraction of the cost of the nearest competitor. This is because they work on a low monthly subscription compared to a large one-off investment. This is great for those that only want to pay for what they use. By keeping everything simple and streamlined, they’ve left off a lot of options that other poker trackers are offering. This makes it seem less complete to us and means that you can’t customise it as much as you may want to. The premium version of Jivaro does feature a lot more information though. As with a lot of the poker trackers it doesn’t function for MacBooks. This is frustrating for Mac users as they either can’t use it or have to run complicated mirror software. Jivaro struggles or won’t work with a lot of poker clients. They do work on Stars but you should check the functionality with your preferred poker site before purchase. Jivaro is very inexpensive, even though they go for the monthly charge rather than the one off expense. Overall users seem pretty pleased with the software and appreciate Jivaro for what it is, a cheap but slightly limited version of what the major brands are offering. Jivaro have not tried to compete with the well established names in tracking software. Instead they’ve cornered a more specific market of those who don’t particularly like HUDs but appreciate they have to use them now to win. Jivaro have made first step software that is perfect in design and capability for those who aren’t very comfortable with this kind of thing. The price makes it very attractive to those who wouldn’t want to pay over $50 for something they can’t make the most of anyway. Jivaro is a lot less technical that the competitors but a lot more user friendly. There are less features but we appreciate each more. Despite having fewer add ons it’s good software and for the price tag it’s great value. If you’ve new to poker tracking software, not good with complicated set ups or just don’t want to break the bank then give Jivaro a try for free. 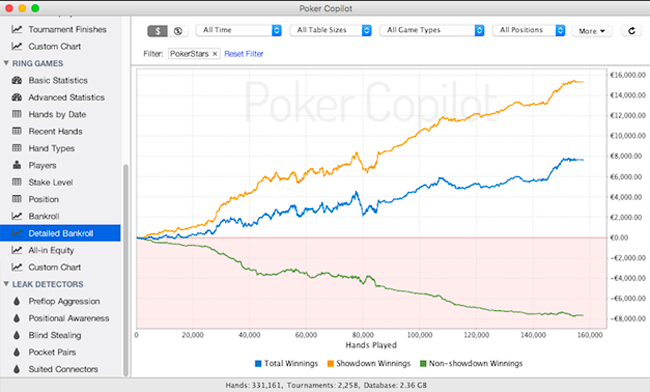 Poker Copilot was originally launched as an alternative to the big 2 in poker tracking, Holdem Manager and PokerTracker. They’re now on their 6th version of the software and Poker Copilot 6 has some useful features for players. Developed originally for Mac (as the other competitors didn’t run on them), they’ve now expanded so they’re usable on all the main platforms. Poker Copilot attempted to break into the market and have succeeded in securing a corner of the market. They’ve attempted to combine the simple with the effective in their design, layout and features. Poker Copilot software has been created to be used by the new players and experienced grinders alike. They’ve made their interface light and fresh with everything displayed clearly. The software is simple to use and easily navigable. It might not have all the features of the main 2 but It is well laid out. Poker Copilot 6 has all the features you’d expect from a full pokertracker, including some unique extras. Poker Copilot has a HUD that features all of the usual design aspects. It pops up on your table and displays 3 key statistics. They’ve decided to keep it simple instead of cluttering the screen, but if you scroll over you can see more information. Poker Copilot’s HUD has data visualisation features that highlight certain players tendencies. This makes it simple to identify player types, sharks and recreational players easily. The database side provides all the analytics you need to improve your game. Keep track of your bankroll, wins and losses and identify weaknesses through the different views. Use the graphs to see your trends and work out your win rates. The Poker Copilot database is perfect for analysing hands after sessions are completed so you can see your mistakes and learn from them. Poker Copilot has a built in leak finder that identifies your weaknesses and mistakes. It creates a report and gives advice on how to plug the holes in your game and ultimately play better. The Leak Finder software is the best way to go from losing to winning. All in all Poker Copilot offers a pretty complete well rounded tracker. While it doesn’t have all the features or analytical power of Holdem Manager or PokerTracker it is able to improve your game and bring you value. Poker Copilot has some good points and bad points which help put the software into perspective when you’re selecting the most suitable for you. You can check the current pricing of Poker Copilot via this link. Their membership is a one-off payment and includes both Hold’em and Omaha tracking software. With this license you can use it on a couple of different devices. Poker Copilot pricing is similar to PT4 and slightly cheaper than HEM 2 (but more expensive than its low stakes version). They do often run promotions and discounts which it’s always worth looking out for. If Poker Copilot didn’t have such stiff competition it would probably thrive, however the market leaders have done very well in creating such robust software for poker players. That being said the majority of reviews rate Poker Copilot highly and feel it brings value to their poker game. For us Poker Copilot 6 is pretty good software to improving your game. Unfortunately we just don’t find it as in depth as the main 2. As a lighter version it works well, but the price tag is still high and pretty similar to PokerTracker 4. Poker Copilot reminds us of pokertracker 4 in a lot of ways but has a less detailed and usable HUD. If it was being offered as a cheaper option it would be tempting but for the same price we can’t really go against PT4. That being said Poker Copilot have done well to consistently improve upon their last software and make it better. If you don’t like the PT4 or HEM 2 interface then give their 30 day free trial and go, it might be the best choice for you. So as you can see there are some great options available when it comes to selecting your poker accomplice. Each have their pros and cons but the choice really depends on what level you’re at. Using a HUD and a poker tracker has become a skill in itself, one which is necessary to succeed at online poker. With the four options laid out in this article we think that Jivaro makes sense as a first step, almost like an introduction to HUDs. It’s cheap and user friendly with some cool features that will start to make you realise what you need from a HUD. It will absolutely improve your game, too. However, in our opinion none of the other trackers come anywhere close to the main 2; Poker Tracker and Holdem Manager. They have in-depth statistics, information and features that are able to take you to the next level. For us the ultimate choice has got to be HEM 2 (though frustratingly it’s not available for Macs – the best choice if you’re a Mac user will be Poker Copilot). Its analytical power, in-depth HUD and add-on integration is just incredible and you can see why they are the original choice. Poker Tracker 4 is another tempting choice, especially for those of us who have issues with older devices – HEM might crash it. It’s much lighter software, but still does everything you need it to (and much much more). There will always be an element of personal choice when it comes to HUDs, during our play time we’ve used lots of different tracking software. The best ones are so well developed now it’s not just about what the software can do for you, it’s about realistically what you’ll be able to do with the software. If you’ve got the time to read up, watch videos and get to grips with all of the features of the different software then pick a complicated one. If you hate that kind of thing then a simpler model is probably the way to go. Always remember that a HUD is only as powerful as you let it be, so use yours right and you can revolutionise your game.